Kenda gave it an enthusiastic “thumbs-up” and so Jester’s will be offering this yummy new bev shortly. Just ask us about it. and remember about the Blue Moon “Paint Your Pint” special on Nov. 18, 2018! Jester’s has BURGERS! Just ask us! and if you’re “In The Mood for Food”, check out Rino D’s Pizza and Wings – right next door!! 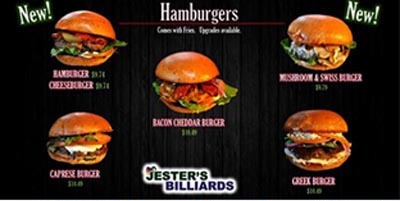 Jester’s Billiards, the BEST sports bar for sports – billiards, darts and craft beers in Gilbert, Mesa, Tempe, Chandler, Scottsdale and Phoenix! Look for us at the intersection of the main streets of Gilbert and Baseline Roads, in the Encore Plaza in Gilbert, Arizona. 1515 N Gilbert RD, Gilbert. AZ.